While debates abound today over the cost, purpose, and effectiveness of higher education, often lost in this conversation is a critical question: Should higher education attempt to shape students’ moral and spiritual character in any systematic manner as in the past, or focus upon equipping students with mere technical knowledge? Faith, Freedom, and Higher Education argues that Christianity can still play an important role in contemporary American higher education. George M. Marsden, D. G. Hart, and George H. Nash, among its authors, analyze the debate over the secularization of the university and the impact of liberal Protestantism and fundamentalism on the American academy during the twentieth century. 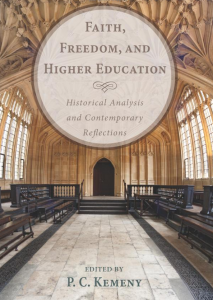 Contributors also assess how the ideas of Dorothy Sayers, C. S. Lewis, Wendell Berry, and Allan Bloom can be used to improve Christian higher education. Finally, the volume examines the contributions Christian faith can make to collegiate education and outlines how Christian institutions can preserve their religious mission while striving for academic excellence. Mark Noll has called the essays “sparkling” and Robert George, professor of jurisprudence at Princeton says that are “refreshing and forward-looking.” Taking Every Thought Captive: Forty Years of the Christian Scholars Review edited by Don W. King (Abilene Christian University Press) For four decades the scholarly journal The Christian Scholars Review has printed seriously academic pieces by Christians scholars, and been a source of inspiration and stimulation for Christian intellectuals and academics. In celebration of their 40th anniversary CSR editor (and C.S. Lewis scholar) Donald King edited this long-awaited anthology of some of their most popular, engaging, or representative pieces. Some are specifically about the the role of Christian colleges and universities, but many are about specific disciplines, with something here for nearly everyone who works in academia.